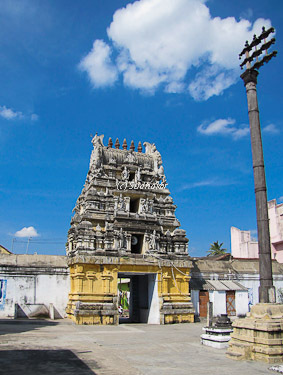 Thiru Velukkai is one of the 108 divya desam temples situated in Kanchipuram. "Vel" means wish and "Irukkai" means seat. Since the Lord Himself wished to stay there to help his bhakthas, this place is known as "Vellukkai", "Thiru Vellukkai". The legend behind the place Thiru Velukkail goes like this. When asuras (demons) became rampant and started to threaten the man kind, Lord Vishnu in His Narasimha avatar chased them away. He settled in this beautiful place out of his own wish. According to scriptures, Lord Narayana granted darshan to sage Brugu here. Saint Peyazhwar in his hymns praises this shrine equal to that of Lord Oppiliappan of Kumbakonam and Tirupathi. Vaishnava Acharya Sri Mahadesikan had praised Perumal in his celebrated Kamasikashtakam (Kamaasi – Kama + Aasika) meaning standing on his own wish. It is said that chanting this sloka daily will bring in immense benefits of the blessings of Lord Narasimha. The shrine is also known as Kamashika Narasimha Sannadhi. 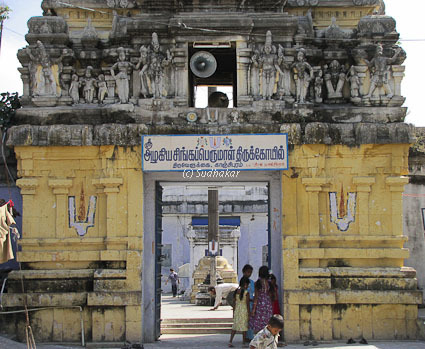 Though this one of the revered Divya desams, the temple is in a dilapitated condition. Devotees can help with donations for atleast the pooja to performed regularly. The Moolavar here is Sri Azhagiya Singar in Yoga Position facing East. He is also known as Narasimhar and Muguntha Naayagan. Thayar of this sthalam is Amirthavalli thayar or Vellukkai Valli. Prathyaksham for Brighu Munivar.